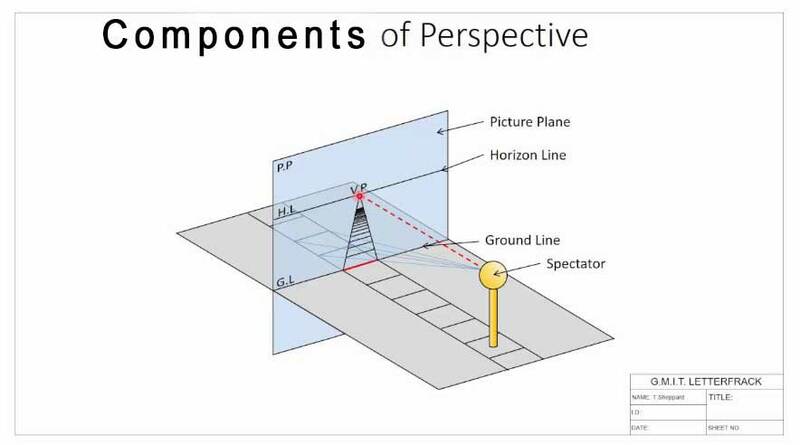 Perspective Projection, Drawing - Its Types, Objectives, Methods. Perspective Projection, Drawing – Its Types, Objectives, Methods. In this article, you gonna learn in details about the Perspective Projection, Drawing – Its Types, Methods, Technical Terms, Procedure, Methods, etc. Technical Terms OF Perspective Drawing. This is such type of pictorial drawing in which the shape of an object looks same as its construction. The picture obtained in perspective drawing resembles the picture taken by a camera. A common man cannot understand an orthographic drawing. Since, in the perspective projection, the actual shape of the object looks like the true one, therefore, even a common man can understand it easily. Perspective drawing is constructed for a building so that the concerned persons, like the owner of the house, officer-in-charge of the department could understand it easily, generally who are not expert technically. The actual dimensions are not given in perspective projection. The object is seen from one point for the construction of this drawing. So, the horizontal lines do not look parallel but seem to meet at a point, and that point is called vanishing point. 1. To represent the actual construction of buildings and other objects. 2. To prepare other Models. 3. To illustrate drawings in pamphlets. 4. To illustrate different parts of the assembly drawing. 5. To represent positions of moving things. 6. The artists construct such drawings to illustrate the actual view. Auxiliary View – Its Types, Methods. [A Comprehensive Guide]. 1. The vertical axes of the drawing are shown perpendicular. 2. The horizontal lines of the drawing look to meet at a point called Vanishing Point. 3. The vanishing points are shown on the horizontal lines in the System of Horizontal Lines. 4. If a horizontal line lies in the horizontal plane, then its actual length will be visible. 5. If some lines is in the picture plane, then its length will be visible short to its actual length. 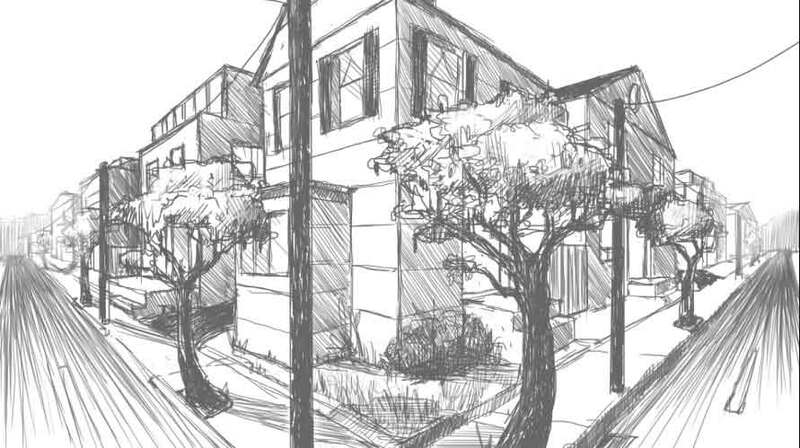 Watch the Video below to learn How to Draw Perspective Drawing. It is the point from where the observer looks object. It is the plane in which picture of the object forms. This plane is parallel to the Earth and in line with the eye of the observer. If some plane is taken on the surface of the Earth. This is called a Ground Plane. This is the line of intersection of the ground plane and the picture plane. This is such a line which starts from observer’s eye and meets the picture plane after passing through the horizontal plane. This is the point on the picture plane which is the point of intersection of the horizontal line emerging from Station point. This is the point on the picture plane which is formed by the intersection of the picture plane and the projection line. This is the point at infinity where the length, breadth, and height of an object vanish. This is the horizontal line which starts from the observer’s eye and makes an angle of 90° with the picture plane. Station point is selected at such a position so, that the vision of the object is very clear. It is selected nearly the middle of the object so, that the angle formed to the sides of the object be kept between 30° to 60°. While drawing a perspective drawing, the horizontal plane is taken at a height equal to the observer’s eye. If the object is small then drawing is drawn by placing the object somewhat above or below the horizontal plane. If the object is placed above the horizontal plane, then its lower view will be seen while if it is placed somewhat below then, its upper view will be seen. Read Also: Oblique Drawing, Projection – its Types, Examples. 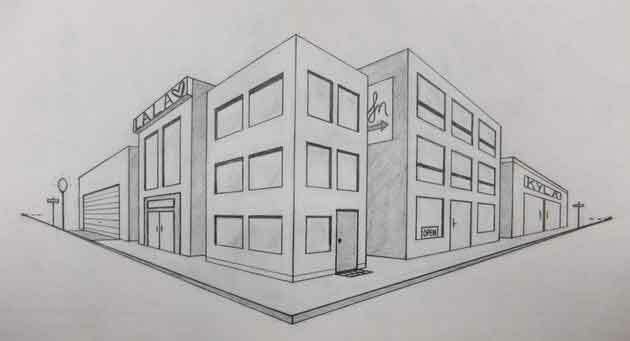 This type of perspective drawing is also called two-point perspective drawing. i. The line of the picture plane is drawn at some suitable place in the drawing sheet. It is represented by P-P.
ii. The top view of the object is drawn making an angle of 30 to 60 degrees with the horizontal line on the picture plane. iii. The station point is shown at some suitable place below the picture plane. All the points of the top view are joined with the station point. iv. The lines joining the top view with the Station point will intersect the picture plane. In this way, the points produced on the picture plane are called Piercing Points. Perpendicular, parallel lines will be drawn downward from these points. v. Lines are drawn parallel to the sides of the top view to intersect the picture plane. Perpendicular lines will be drawn from these intersecting points in the downward direction. vi. A horizontal line is drawn at some suitable position below the station point. The points where this line intersects the previously drawn vertical lines will be the Vanishing Points. vii. The front view of the object is drawn at some place below the horizontal line. viii. Horizontal lines are drawn from the different points of the front view. These will intersect the vertical lines drawn from the top view. In this way, the points produced by lines coming from a single point of top view and the front view will be the points of the Perspective drawing. The perspective drawing will be completed by joining these points to the right and left vanishing points. Read Also: Isometric Drawing, Projection – Its Types, Methods. Perspective projection is drawn mostly by this method. In this method, only one vanishing point is selected. 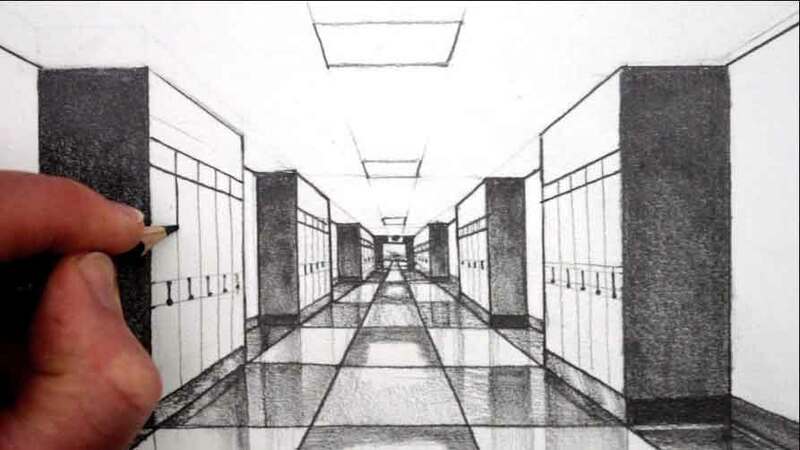 This type of perspective drawing is also called one point perspective drawing. i. The top view is drawn at a suitable place and front view under it. ii. The picture plane is shown under the top view and ground level under the front view. iii. A station point is shown by one side of both the views at some suitable angle, and all the points of the top view are joined with it. iv. The points arising from the intersection of the picture plane and the visual rays joining the point of top view to the station point will be piercing points. v. The horizontal line is drawn between the picture plane and ground level. The vanishing point is put on the station point on the horizontal line. All the points of the front view are joined with it. vi. The vertical line under the top view and the line going from front view toward the vanishing point will intersect each other. The point arising from the intersection of lines emerging from the same point of the two views will be the point of the perspective drawing. By joining all such points, the perspective projection will be completed. Read Also: Estimation of Building – Long Wall Short Wall, Center Line Method. Thanks! for Reading this Article. Please, Don’t forget to share it.